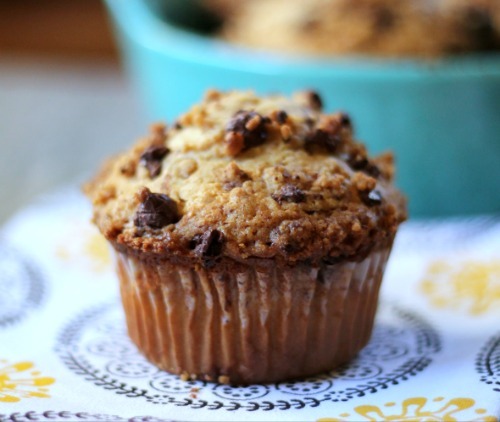 These Blueberry Banana Yogurt Muffins are out of this world, crazy good! A cinnamon sugar crunchy topping and bittersweet chocolate chips set them apart from the others! A white Kitchen-Aid mixer? Am I totally lame or what? So I won a Kitchen-Aid stand mixer while at the BlogHer Food conference. I already have a red one but I’m going to give that one to my mom. I’ve been dying to get a new one because I want a different color but I didn’t want to spend the money on another one. Perfect timing, right? I was told to choose two colors in case my first choice wasn’t available. 1st choice: white. 2nd choice: Aqua. I’m pretty sure my first choice will be available. With all of the fun, beautiful colors to choose from, how many people really choose white? And now to the serious, must know question: why did I choose the white mixer? I’ve sorta fallen in love with the clean, crisp, cozy look of farmhouse style kitchens. You know, the kitchens with white cabinets, darker countertops, wood floors and white accents with an occasional pop of color. While my kitchen is far from being a farmhouse style kitchen, I thought that a white stand mixer would give help give it the look I so long for. My dream kitchen would be just like the kitchen I described above. It would have to be a huge L shaped kitchen with an island. A big bright window over the sink is a must. Crisp white cabinets and dark granite countertops would make me swoon. Stainless steel appliances and wood floors would be the icing on the cake. When we finally get around to deciding to buy a different house, some of those, if not all, will be on my check list. And a two car garage will be on Ken’s. This first thing I’d make in my dream kitchen would be these crazy good Blueberry Banana Yogurt Muffins. No mixer is needed so I wouldn’t be able to use my white Kitchen Aid mixer. But that’s ok. It will get its workout making cookies, cakes and breads. I’m a sucker for dark and bittersweet chocolates so I used Ghirardelli bittersweet baking chips in these muffins. White, semi-sweet and milk chocolates would all work as well. Use whatever you prefer. I used organic light brown sugar and evaporated cane juice in my recipe. You can use regular brown and granulated sugars if that’s what you have on hand. Fresh or frozen berries will work. I prefer frozen when baking. They’re cheaper but work just as well. Enjoy. 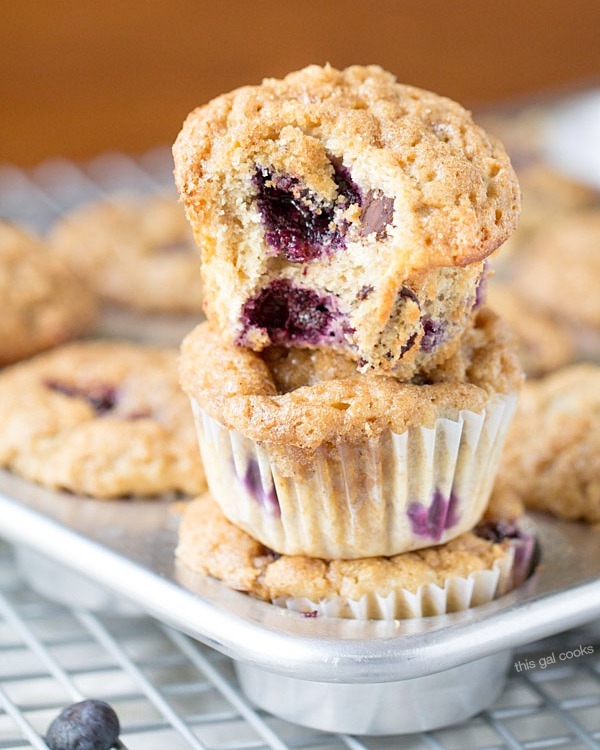 The BEST Blueberry Banana Yogurt Muffins! Topped with a crunchy cinnamon sugar topping and filled with blueberries and bittersweet chocolate chips! Preheat your oven to 350. Line 15 muffin cups with cupcake liners. Whisk together the flours, baking powder and salt. In another bowl, whisk the egg and then add the sugars and whisk until thick. Add the melted butter and yogurt and whisk until combined. Fold in the mashed banana. Carefully toss the blueberries and chocolate chips into the flour mixture. Then carefully fold the yogurt mixture into the flour mixture until combined. Add the batter to the muffin cups, filling about 2-3 - ¾ full. I used a cookie scoop to spoon the batter into the muffin cups. It makes it crazy easy and it's less messy than using a spoon. Whisk together the 2 tbsp melted butter, the ½ C brown sugar and the 2 tsp cinnamon. Top each muffin with some of the mixture. Start out with a little on each muffing to make sure you have enough to go around. Continue to top the muffins until all of the cinnamon sugar mixture is gone. Bake at 350 for 25-30 minutes. Once the muffins are done baking, remove from the oven and cool on a baking rack for about 20 minutes before serving. 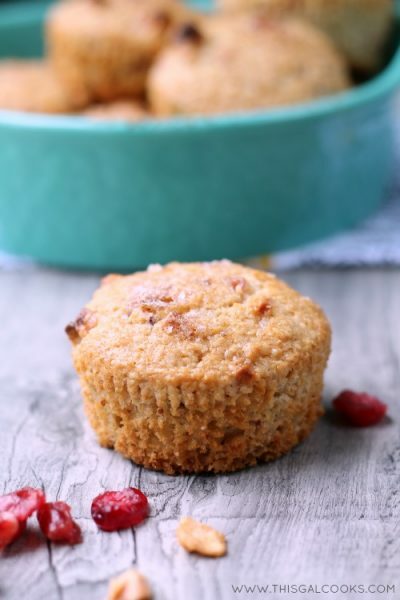 For a vegan option, these Apple Berry Bran Muffins are perfect! I LOVE yogurt in muffins. Just adds a little zing and it is so much better for you. Thanks for sharing! That’s MY dream kitchen, too! How did you guess? As for the muffins, and the photos, ‘beautiful’ and ‘beautiful’. Haha – when I bought my Kitchen Aid Mixer at WIlliams Sonoma back in 2001 I chose white. There were so many fun colors but I figured it would be a classic and stand the test of time. It has. 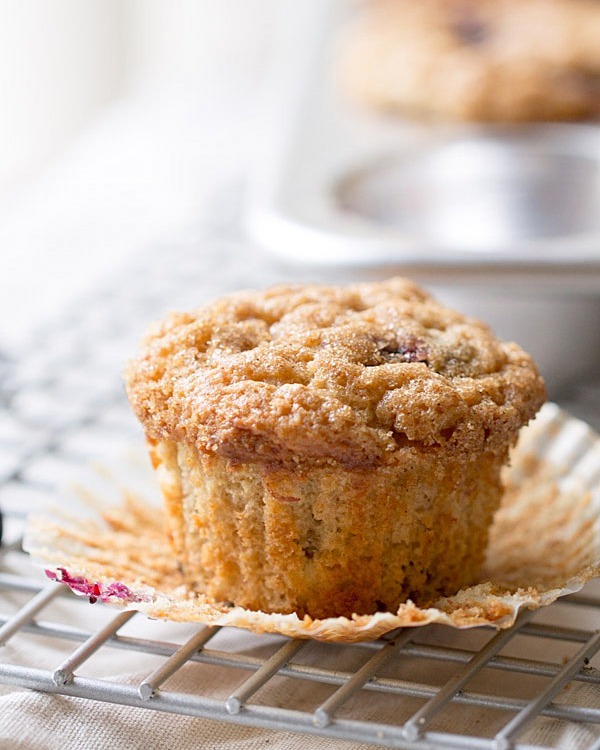 :) The muffins look amazing – my Husband would swoon over these too. He can resist nothing with blueberries! Pinned!! 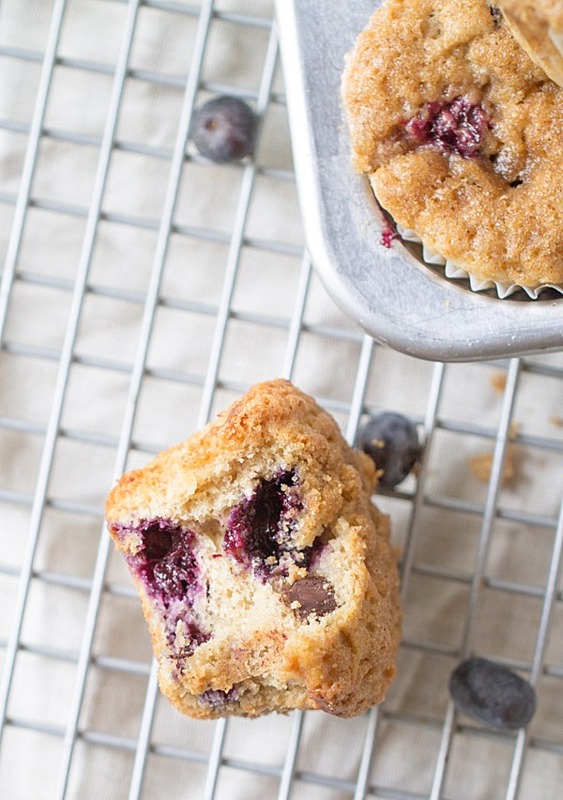 These look like the perfect blueberry muffin. Can’t wait to try this recipe! That’s so funny about the mixer! But I totally understand, white just looks so clean and fresh! I’m really hoping the kitchen fairies come to my house tonight while I’m sleeping and whip up a batch of these. 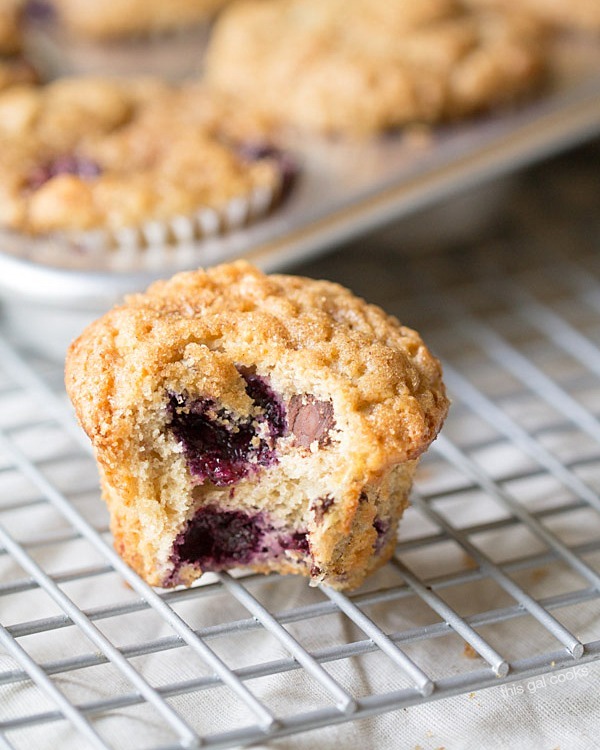 You just can’t beat blueberry muffins! It really does. I have the red mixer right now and up until the time I bought it, I was dead set on the red mixer. You wouldn’t have been able to convince me to choose a different color. Funny how we change our minds about things so quickly. I still love my red mixer but I’m going to give it to my mom to love now. Ohh I love baking with yogurt – it instantly adds a fluffiness to the dough that you really can’t beat. I have a white mixer and I’ve wanted red for a long time. I got white because it would match anything, and I do like the crispness too. I’m into bold colors now, however, so we’ll see. Your dream kitchen sounds lovely, and I hope you get it one day. 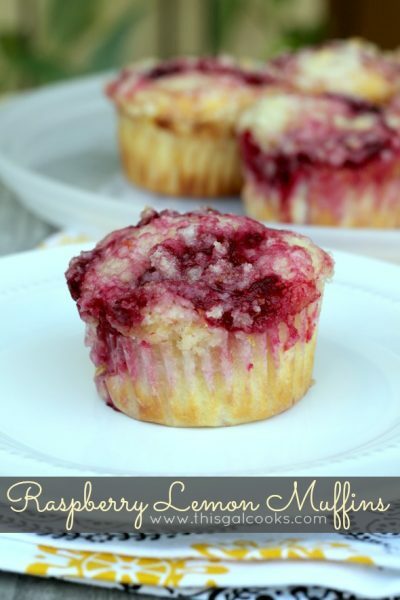 :) It sounds like I need to try these muffins, because I’m always on the lookout for the next best thing! There are so many great colors to choose from, Marcie! It was hard to choose between white and real but I went with white. I can always accent with teal colors. And if I get bored with teal, I can accent with a different color! I made these to celebrate the birthday of a coworker and they were well-received. They are dense but still moist and very flavorful. I used bread flour for some of the all purpose flour and used the small froze Maine blueberries, which were a good size for the muffins. Family loved them as well. They take some effort and the recipe makes just 16, so I would double it next time.